Make sure that keywords are strategically included in your blog entries (more on strategic placement below). It’s also a good idea to use keywords that are both relevant AND popular enough that people are searching on them. To determine keyword relevance and popularity, the Google Keyword Estimator is a good tool. With most blogging software, the title of your post is also reflected in the title tag for the page (a highly visible tag that Google reads). So it’s important to include relevant keywords in your blog titles. As always, balance is important. This is where a little creativity is required. Use keywords in your title to draw in search engines while at the same time, make sure the title is compelling enough to draw in readers. Including keywords in the URL will make your blog post that much easier for Google to index. For WordPress users, this URL is called the “permalink.” You can customize the permalink and sprinkle in your keywords. Whether you update your blog once a month, every 2 weeks or once a day, consistency is important. Not only does it set an appropriate expectation among your regular blog readers, it trains Google’s web crawlers to come back to your website regularly and index the new content. Take advantage of opportunities to create links from your blog entries to other areas of your website. For instance if you mention Accpac Training in a blog entry, that term should be hyperlinked to a page on your website that provides more information about the training options you offer. Google’s web crawlers can only read and index text … so if your blog contains images, make sure to assign ALT text. And be sure the ALT text incorporates your primary keywords. Use social media to promote your blog and link to your latest entries. Twitter, LinkedIn, and Facebook have built the audience for you … it’s your job to redirect some of that traffic to your blog and hopefully gain a few new fans. To be clear, good content trumps everything else. So never sacrifice quality for something that’s stuffed with keywords and reads awkwardly. Create great blog entries first, then go back through and look for opportunities to rephrase sentences, titles, and headings to naturally incorporate keywords. P.s. Let’s face it … you didn’t start a business because you love to write. So if you’re short on time and long on unfinished tasks, take a look at our Content Vault. It’s loaded with professionally-written ERP, CRM, HR, and Nonprofit Accounting software articles that are ready to plug into your blog or newsletter. 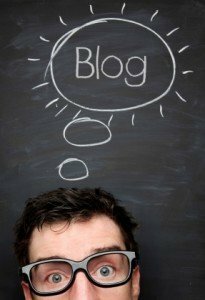 Great notes for those looking to increase blog traffic. A very inclusive list. Thanks James. I just took a visit to YOUR blog … looks great. Good content and very consistent. Nice work!